Phil Brown aims to get Preston ‘knocking on the Premier League door’ again after landing the Deepdale manager’s job. Brown and his assistant Brian Horton have signed 18-month contracts and will take charge of the team for the first time in tomorrow’s FA Cup clash with Nottingham Forest. With North End bottom of the Championship, Brown is well aware of the size of the task in front of him. But having guided previous club Hull out of a similar position, the 51-year-old is confident of doing the same here. One of the first people to send their congratulations on his appointment was Sam Allardyce, the manager he assisted at Blackpool and Bolton. Brown told the Evening Post: “Sam texted me from the beach in Dubai...I think he was on his second bottle of champagne. “He’s pleased I’m back in the game and speaks very highly of this club, where of course he once played and coached at. A lot of people have spoken highly of PNE to me, and they don’t need to tell me what a good club this is. “I have witnessed that in the past from not too far away at Bolton and Blackpool. They are arch rivals, and now I’m manager here, they are my arch rivals. “Hopefully we can get them on to a level playing field again one day. “Four times in the last 10 years Preston have knocked on the door of the Premier League. Now we are knocking on the door of League One, which is not a nice feeling. 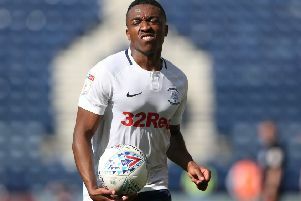 Brown’s arrival at Preston brings to an end a nine-month exile from the game since his dismissal by Hull City last year. He’s grateful for being given the chance to manage again, revealing he was the only candidate interviewed for the job. Said Brown: “Finding myself out of work for nine months wasn’t great, so thank God for the Preston board. This has given myself and Brian a chance to prove ourselves in a very difficult situation. “Many people will say this is a big challenge, but as far as I’m concerned it is not an impossible challenge. “If we can get these players into a winning frame of mind as soon as possible, who knows where we can take it? “The moment I met the chairman and owner, they made it clear to me in no uncertain terms that I was their No.1 option. There was no one else being interviewed – yes they had a shortlist, but once I said ‘yes’ it was my job. “This gives me a chance to do what I’m good at. “What is needed at the moment is to change people’s mentality, the players here haven’t deliberately got themselves into this situation. Brown expects to be busy in the transfer market this month as he shapes a squad which he thinks is capable of battling their way out of relegation trouble. He has targeted winning half of North End’s remaining 22 games to ensure they are playing Championship football again next term. Said Brown: “I know what I want in terms of the squad. I want to bring in certain characters and players to help the players who are already here.